Carbotech XP12™ is an excellent Ceramic compound that has good initial bite, modulation and release, and rotor friendliness with 100% non-corrosive dusting. The XP12™ is recommended for advanced track drivers and race applications. XP12™ is found to be most affective on race cars weighing 2,400lbs or more using R-Compound tires; or street cars weighing 3,200lbs or more for track use only. Ideal for LMP1, LMP2, DP, T1, T2, T3, H1, H2, GT1, GT2, GT3, TC, GT, ST, GS, MX-5 Cup, etc. Although this compound is capable of being used in cooler temperatures, Carbotech XP12™ is NOT recommended for use as a daily driven street pad due to possible elevated levels of dust and noise. 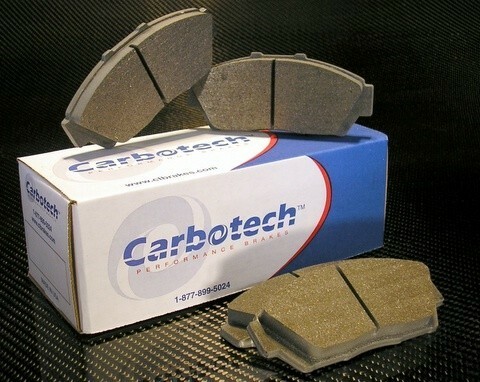 CounterSpace Garage recommends this pad to be used on S2000 time attack applications as well.